Book three in the Quantum Gravity series and I think the one I like the best, by a faery whisker, as it involves a trip into Faery itself and Lila’s acquisition of Tatterdemalion as a constant ‘companion’. Sentient clothing that mocks the wearer and might kill you as soon as help you: what’s not to love? 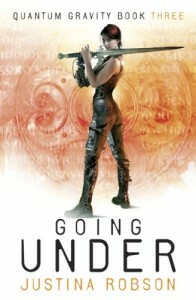 Thanks for finally talkig about >Quantum Gravioty 3: Going Under – Justina RobsonJustina Robson <Loved it!